Minister of Public Security Khemraj Ramjattan has declared that APNU+AFC defector Charrandas Persaud is a villain. Appearing on the political talk show Context, the Chairman of the Alliance for Change (AFC) told host Enrico Woolford that the former Party member “never complained” while in government but is now claiming a conscience vote. “It is clearly a case where he is compromised and obviously those who moved the motion, or at least one person who moved the motion, knew about this. They knew that they had Charrandas in the bag. Now that is not the kind of democratic process we want for this country. You had to know you had somebody in the bag,” Ramjattan claimed. When Woolford pointed out that Government should’ve also known that one of its members was compromised Ramjattan stressed that they did not know even though they spoke to each member about whom they received information. “This thing was organised beautifully. All that will come out of the investigation going on. 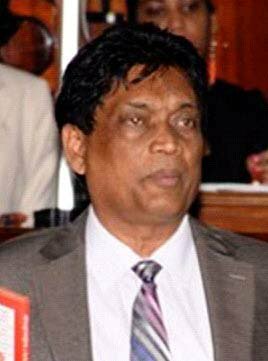 We are going to benefit from it because Guyanese don’t want that kind of politics in Guyana anymore,” Ramjattan noted referencing the fact that businessman Peter Ramsaroop was present and ready to offer Persaud security. “Those who would’ve done that will pay the penalty. We’ve already been doing investigations with the senior members of the government. Very valid investigations, you might want to say we are politically motivated, we are not. The President, the Prime Minister, the entire Cabinet want genuine political practice and what we saw there is absolutely ludicrous and illegitimate,” he stressed. During the one hour show Ramjattan also expressed his support for government’s position that the threshold to constitute a no confidence motion was not reached. “The number of persons who would constitute that threshold is 34 not 33,” he said acknowledging that there initially was the thought that it was 33. “After being blindsided by the immoral act of Charrandas Persaud we sought some legal advice. We also went back to the text of the constitution, we also go a number of authorities that compute this special arrangement that can bring down a government and recognized it is half the number of elected members plus one,” the lawyer explained. 99.9% of AFC members were affiliated with the PPP/C.